Welcome to the second edition of ‘Frugal Feast’, a mouth-watering regular feature which I’m working on with my blogger friend Eva from Girl Counting Pennies! Our Frugal Feast feature is a collection of frugal recipes designed for people on a tight budget like us. Eva and I are both working very hard to save money in order to pay off our debts faster and grocery shopping is one area where we have both cut back significantly. Our aim is to provide recipes for meals which are cheap to make without compromising on deliciousness! Every fortnight on Tuesdays, Eva will be posting her Frugal Feast recipe here on A Disease Called Debt and I will be posting mine over at Girl Counting Pennies – so don’t forget to visit Eva’s blog to view my recipe after reading hers below! Hello everyone! I am Eva, Hayley’s partner in crime for our ‘Frugal Feast’ feature. Today I thought I would share with you all one of my favourite dessert recipes. The first time I tried it was a couple of years ago at my friend’s house warming party and I simply had to ask her for the recipe! This is my own variation of this delicious trifle and the best part is that it does not involve baking unless, of course, you want to make your own Madeira (sponge) cake. If you have time on your hands and if you are generally very creative in the kitchen, you are more than welcome to make your custard. I got mine from the store. Okay, let’s begin. I used raspberry jelly this time around as could not locate a blueberry one in the store. If you do not like jelly or if you are a vegetarian, skip it. You can also use frozen blueberries, this will help bring the cost down. You will need one small saucepan, a tablespoon, a teaspoon and four serving glasses. Place your saucepan over medium heat and add half a pint (approx. 300ml) of water. Add jelly and stir until dissolved for about 3 minutes (do not bring to the boil). Take out four serving glasses and divide the contents of your saucepan between them. Put the glasses away in the fridge for the jelly to cool and thicken. 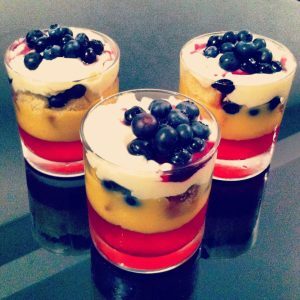 You can also add a few blueberries into your jelly base if you want to make it more interesting. Wash your saucepan, dry it thoroughly and place it on the hob over low to medium heat. Break your chocolate into small pieces and allow them to melt slowly without bubbling. Once the chocolate has melted, add soft cheese and stir thoroughly together. Your white chocolate ganache is ready (and it tastes heavenly)! Once again wash your saucepan, place it on the hob over medium heat and add 10-12 washed blueberries, a splash of water and a teaspoon of sugar. Stir your ingredients together. Wait for blueberries to pop and dissolve along with sugar. This is the fun part! Take your serving glasses out of the fridge. The jelly should have thickened by now (if not, keep in the fridge for a bit longer). Divide all your layers between four glasses. Add a layer of custard. Cut Madeira cake into small cubes and add on top of custard. Add some blueberries. On top of blueberries, add your white chocolate ganache. Pour your blueberry sauce on top of white chocolate ganache and decorate with some blueberries. Cool in the fridge for 5-10 minutes before serving. Now put the kettle on, make yourself a nice cup of tea and enjoy! I promise you will not be disappointed! If you have any questions about how to make this dessert, please ask away in the comments section below and I will answer them! Author Bio: Eva is a personal finance writer and blogger currently documenting her journey to debt freedom over at her blog Girl Counting Pennies. Why I’m swapping wine for green tea! Planning a cheap birthday party for kids. Yum! That sounds way better than cheap halloween candy! Stefanie @ The Broke and Beautiful Life recently posted…GIVEAWAY!!! And the Etiquette of Midweek Weddings. My wife is the dessert maker in the family and this sounds like something she’d like. I’m passing on the link to her. Thanks! Just out of curiosity, have you ever made this with home made custard? I wonder which would taste better? I like the fact that you added dollar amounts per ingredient. Taht really helps with the whole frugalness of it! I also love reading English terms for common items like hob! “Yes, I know, there are only 3 serving glasses in my photo, but it’s simply because I could not resist the temptation and had eaten my portion prior to taking photos for the blog!” – That’s too funny!! Lyle @ The Joy of Simple recently posted…On How David Coverdale of Whitesnake Inspired Me To Live The Life I Wanted!! Madeira cake is my favourite, I am addicted! 😛 Your pound cake sounds delicious! This looks yummy and so pretty~ I’m not really a dessert person, but this I can definitely go for. This looks so simple but delicious! I will definitely be trying this out with me boys. Thank you for sharing! !